Both xterm and Terminal are terminal emulators common to UNIX based systems running the X Windows System. A terminal emulator is basically a terminal application that allows the user to access programs that are originally developed to communicate with some other type of terminal. It simply replicates the functionality of classic computer terminals. Terminal emulators are mostly used by system administrators because some built-in command line programs are not able to work on their own so third-party terminal emulators are used to talk to the system. Command line often is the best way to go on Linux systems because most of the tasks work best with the console. The built-in terminal emulator for Windows is “Command prompt”, while Mac OS X uses “Terminal” as its terminal emulation application which is located in /Application/Utilities. Terminal is one of the most important applications for Linux users that provides users access to the shell. Terminal is where the true power of the Linux rests. However, Linux offers a number of terminal emulators exclusive to every GUI version. Linux systems running the X Windows System use “xterm” as their default terminal emulator program. Although, xterm may seem a bit classic, it’s still the default terminal for the X Windows System which based on the philosophy of text only. Terminal is a command line interface which allows users to communicate with the computer in the same way the written word is for human beings. Terminal to Linux is like Command Prompt to Windows. It’s one of the most powerful features of Linux that provide users access to the command line interface. Simply put, Terminal is the Linux desktop environment’s default terminal emulator. Other desktop environments like Ubuntu also use Terminal as their default terminal emulator package. Each desktop environment has different methods to access the Terminal. One of the simplest methods is to hold Ctrl + Alt +T keys at the same time that will launch the Terminal Window. XTerm is the default terminal emulator program for Linux systems running the X Windows System. You can simply type xterm in the Terminal window and hit enter and it will launch the X11 environment along with an xterm window. However, in GNOME desktop environment, xterm is not installed by default. You must install in first and launch xterm from another terminal emulator such as Terminal. Plus, you can also create your own desktop launcher to open xterm window. 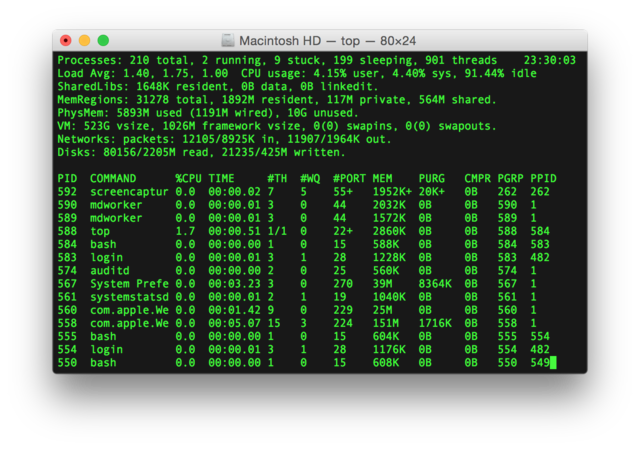 Unlike Terminal, users can have several instances of xterm running at the same time. Both Terminal and xterm are terminal emulator programs that allow the use of terminal in graphical environment. It’s a text-only window in a GUI which allows users to execute commands directly. It’s the default terminal emulation application for Linux. However, Linux offers a variety of terminal emulators, one of which is the “xterm”; it’s the default terminal emulator for Linux and UNIX systems running the X Windows System. It’s a sophisticated terminal used for lightweight distributions. Users can have several instances of xterm running at once on the same display meaning each window corresponds to a separate process with each one providing independent input and output for a shell or process running it. Terminal, on the other hand, controls only one session at a time meaning a controlling terminal has a one-to-one relationship with a session and each session runs separately as the child process of the Terminal. The terminal on which a session is logged becomes the controlling terminal for that process. Anything you cut (⌘-X) and copy (⌘-C) is stored in the clipboard and the system further reads it from the clipboard when you use paste (⌘-V). A selection is not put into the Terminal automatically. The selected text you copied is initially stored in a place called the ‘pasteboard’. XTerm, on the other hand, only uses the clipboard buffer to copy and paste text, however, it’s not used in the default configuration. Xterm only supports the PRIMARY buffer by default which receives input only when the user highlights text with the mouse and the selected text is pasted in the same window when the user presses the middle mouse button. One of the easiest ways to open a terminal in Linux systems is to hold the combination of Ctrl + Alt + T keys simultaneously and the terminal window will open. It can only be accessed from the Utilities folder in the Applications folder by opening the Terminal application. You can also look for Terminal in the Dash, or add a shortcut to your Launcher. Pressing Alt + F2 at the same time and typing “gnome-terminal” will also open the Terminal window. However, you have to simply type xterm in the Terminal window and press enter to launch the X11 environment along with an xterm window. Although both xterm and Terminal are terminal emulator programs for Linux and UNIX based systems, xterm is the default terminal emulation application for systems running the X Windows System. Terminal is the command line interface which allows users to get access to the shell. It is the beating heart of Linux and one of its most powerful features mostly used by system administrators because most of the built-in command line programs are not great on their own and they need third-party programs to interact with the system through commands. Linux offers a variety of terminal emulators including xterm, which is the default terminal emulator for the X Windows System. Sagar Khillar. 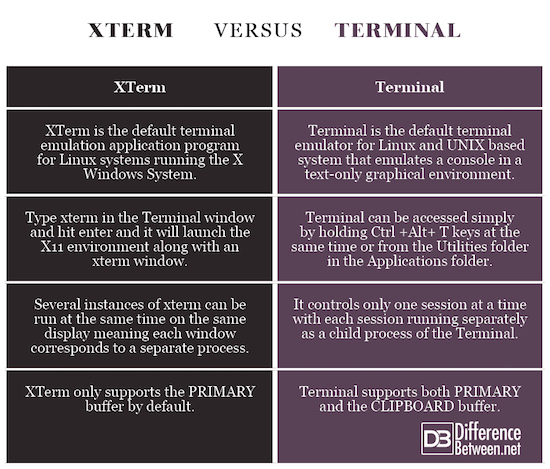 "Difference Between Xterm and Terminal." DifferenceBetween.net. June 7, 2018 < http://www.differencebetween.net/technology/difference-between-xterm-and-terminal/ >. Difference between begin, and began?